This Modernist safety razors sleek design is both practical and fashionable. The black acrylic is polished several times to obtain it’s ultimate finish.The head is set at a mid aggressive angle which a lot of seasoned wet shavers prefer. It is a solid 3 piece head, which is chrome plated it unscrews easily for blade replacement and cleaning. 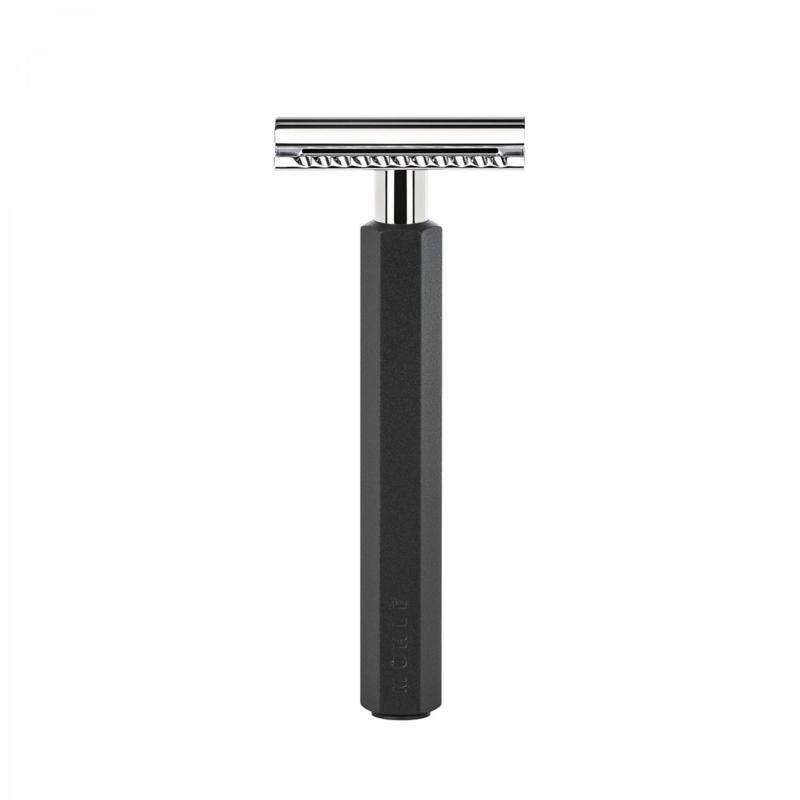 Muhle Kosmo Safety Razor Black are great razors. The stylish handle has a 1960’s shape to It. The handle Is black resin, and the Jet black look Is powerful. 110 mm In length although It seem’s shorter, maybe due to the shape of the razor. Also the head Is Chrome, which Is In two basic pieces. Basically It Sandwiches the double edged blade between the head by tightening It with a screw cap. This middle aggressive head Is a close safe shave, It would be a great first time razor. 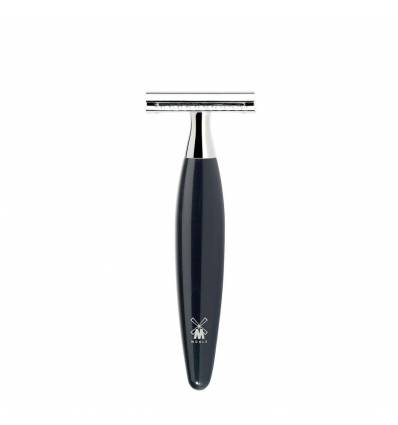 This style razor is pretty bombproof. You can’t go wrong with this highly polished acrylic. As it simply won’t perish, the finish is brought about by a several gradient polish like a piece of fine marble. This safety razors chrome plating will withstand grime and what a shaving safety razor has to go through. Although once a week or so we recommend giving it a strip down and clean. 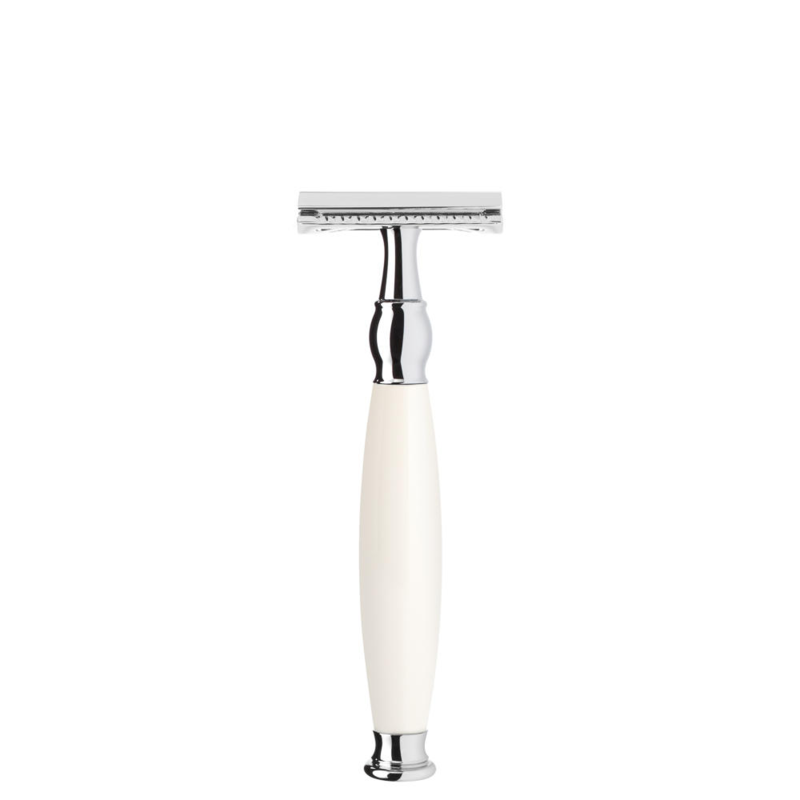 Shaving with a this razor is an effective way to shave, we recommend small strokes as opposed to the long shaving strokes. Also adequately prepare your skin and stubble with hot water and a solid warm lather. Pre shave oil is also a nice protector. At Edward’s we have 8 double edged blade brands for your choosing. 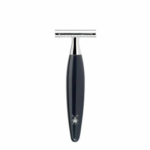 This Muhle razor comes with a Muhle blade, It will last from 5 to 8 shaves. Safety razor blades are also eco friendly as opposed to the plastic disposable razors, due to plastic being harder to recycle. Sadly a lot of the worlds plastic ends up in our sea’s. 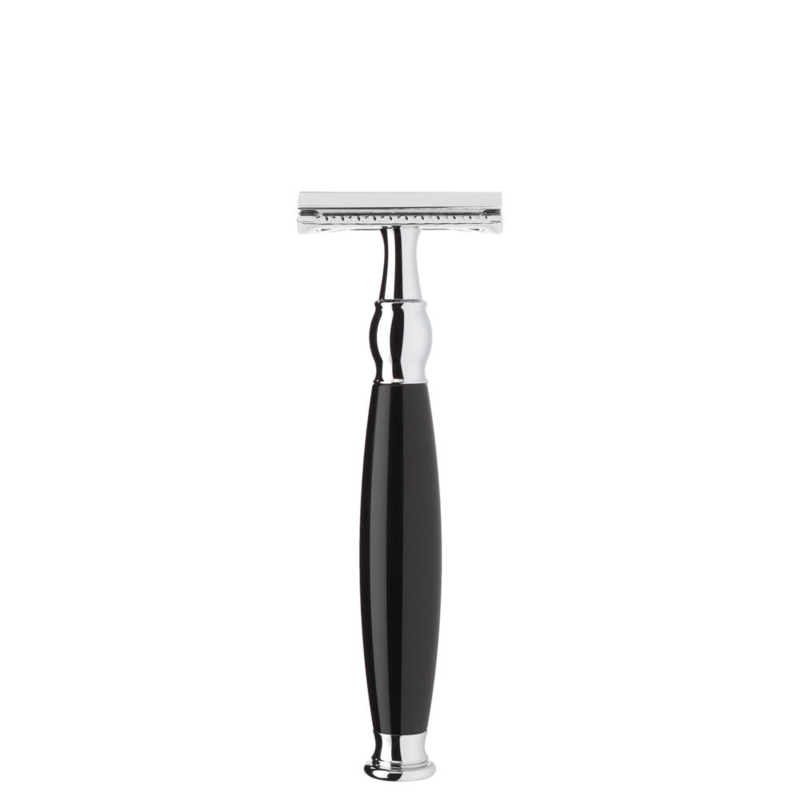 Muhle razors are the perfect accompaniment to the Muhle Kosmo Safety Razor Black. We have added a link to purchase more below. 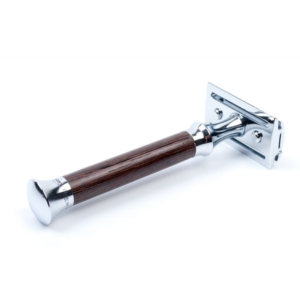 Our blog is an ever changing source for safety razor knowledge. Where you will find all that you need to know about these excellent shaving razors. So stay tuned.